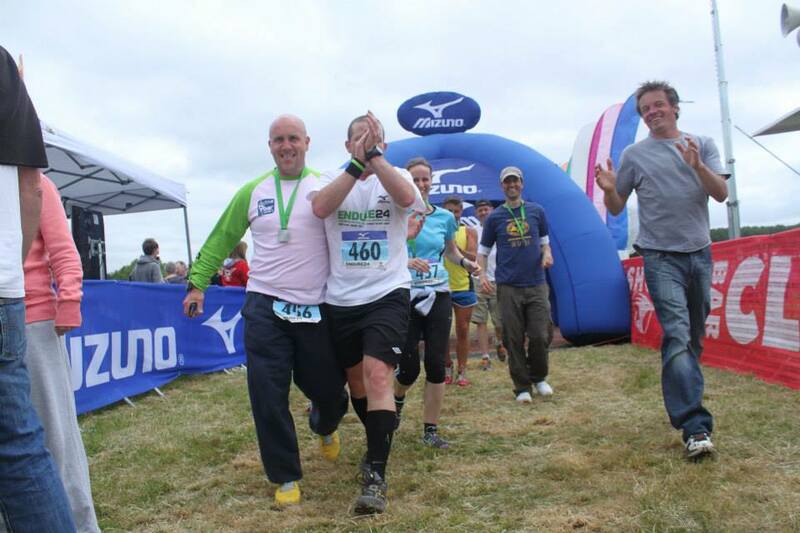 The Endure 24 event is a real festival of running. The event is in its second year and takes place over a weekend in June at Wasing Park, Near Reading, Berkshire about 15 minutes drive from my house. The theme of the weekend is a 24 hour endurance event with options to enter as a Solo runner, Pair, Teams of 3-5 or Teams of 6-8 with Male, Female and Mixed category options. The event was first held in 2012 and was the source of my only Ultra running “claim to fame” with a win in the Male Solo event in when all the other leading Male solo runners decided to stop between 100-105 miles and I limped around one more lap to claim the win in a less than heroic fashion. The week before the event I put together the Race Plan for the team (in Excel) having checked everyone’s suggested 10k times and worked out a running order. My local running club the Reading Joggers were defending champions in this category and were again putting out a very strong team so challenging them was never on the cards but we wanted to acquit ourselves reasonably well. On the morning of the race I arrived a couple of hours before the race to meet the rest of the team. Jo Amor had been responsible for most of the pre-race organisation and had done a superb job arranging food and supplies and I arrived to a fully setup campsite. As I parked up I heard the PA announcer call my name out as he was relaying facts from the previous years race. “Did you hear that Stouty?” I asked him… “All bloody morning mate” he replied in an aggravated tone. 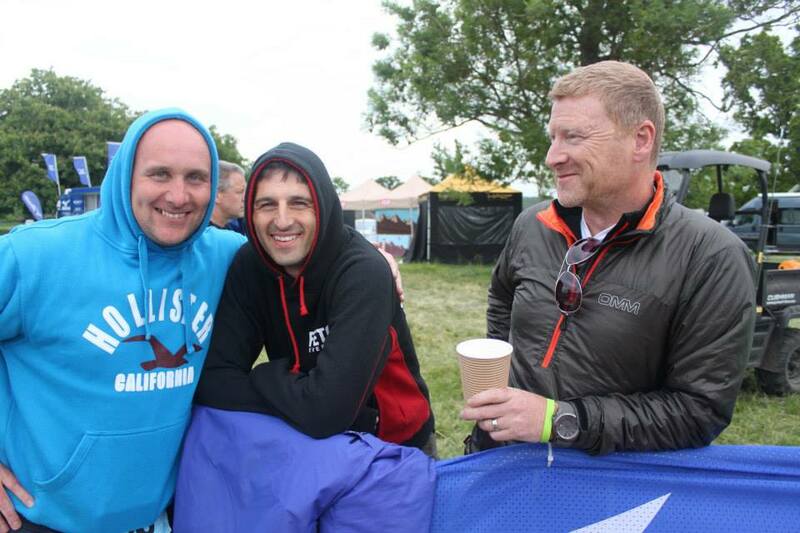 In fact the heavily sarcastic hero-worship became a bit of a running joke for the weekend as I bumped into and said hello to a few Facebook friends, was introduced to a few others and with the odd PA shout out. The icing on the cake was when someone approached Stouty and asked him if he was Stouty. He perked up at a bit of attention but was instantly deflated when the person asked where his running buddy was! To his further annoyance, I had the foresight to bring a sun lounger to sleep on with a thick mattress, blankets and a sleeping bag, which was all rather comfy. Each time I had a wander around the campsite or run a lap, Stouty tried to move in on my territory. Get your own bed mate! I met the rest of the team and we ran through the race plan. I had planned to start with the quickest runner (Pat) in order to ensure we got ahead of the crowds at the first changeover point before the runners spread out. 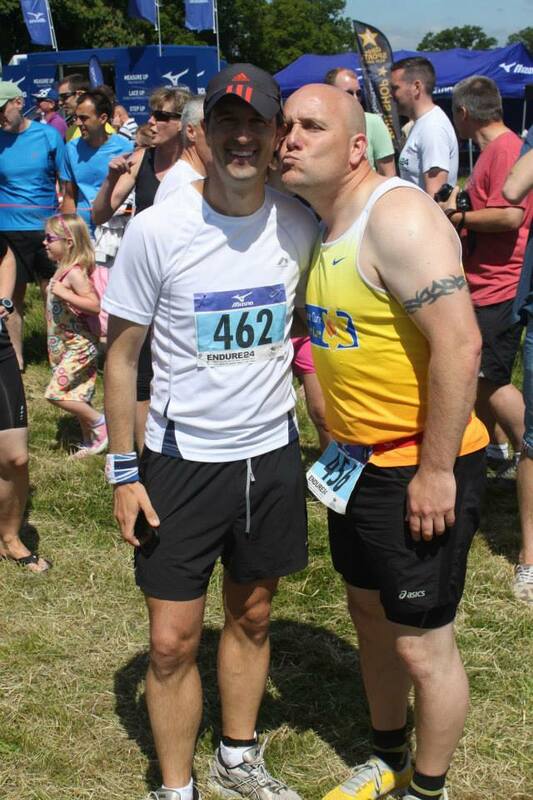 Stouty and I followed Pat on the basis that the Ultra runners were likely to do more laps at the end if required. Paul Hendry followed me, then Jo Amor, Andy Woodman, Cath Cox and Matt Studdart brought up the rear purely on the basis that he was arriving later in the afternoon and was under no time pressure to arrive. Based on 10k personal best timings, we worked out we could get pretty close to 5 laps each (40 laps = 200 miles). However, there was likely to be some slippage due to tired and stiff legs, running legs in the dark and the up and down nature of the trail and uneven flooring. We each had some projected timings for the laps and I was scheduled to run around 1pm, 5pm, 10.30pm, 3.30am and 8.30am. At 12 noon the event started with Solo Runners, Pair Runners or Team Runners all starting their 5 mile trail loop around the grounds. The first mile involves a run along a tarmac path up a gentle hill (it would feel like a mountain later) and onto a track path and then slightly stony trail. The route was undulating the whole way with a couple of sharp hills and a couple of tight turns. 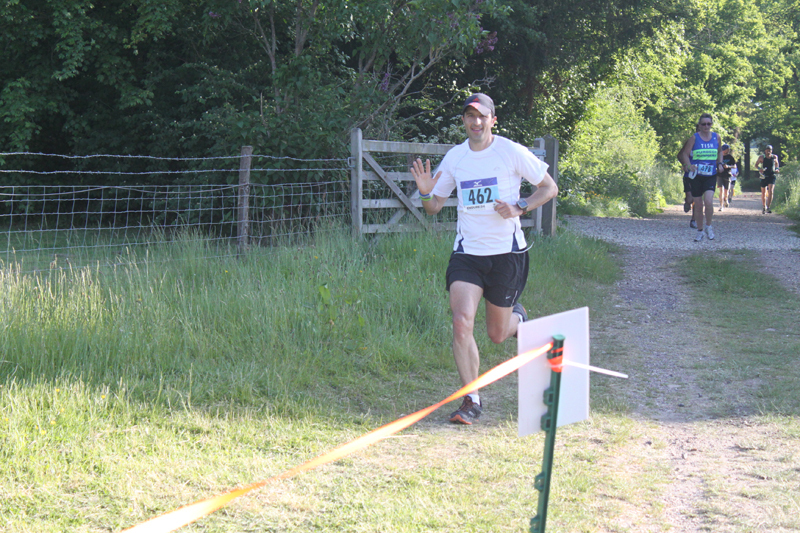 The first couple of miles is more uphill and miles 3 and 4 were more downhill and the final mile involved a weaving run around the lumpy grass area of the campsite and through the start and finish area and changeover zones. The lead runner Steve Davies (GB 1500m runner) came through in a blistering 27mins but Pat was only a couple of mins behind and put in the teams quickest lap of 30.35 and handed over to Stouty who bolted off. The runners were pretty spread out after the first couple of laps with the team runners ahead of the Solo and Pair runners who were taking it easy. Stouty put in a 37.44 lap and handed the rubber wrist band which acted as the baton (we each had chip timing devices aswell) and I set off in pursuit of two runners a few yards ahead of me. I hammered the first 100 metre straight caught up with a couple of runners and then spent the next 2 miles fighting to get my breath back… not a good idea. I kept up a pretty decent pace (for an Ultra plodder) and finished my lap in 34.29 before handing over to Paul Hendry who also put in a quick lap of 33.40. The pattern continued with Paul (33.40) handing over to Jo (42.19) to Andy (38.00) to Cath (38.06) and finally to Matt (36.53). By this time we were behind the Reading Joggers A team but in a bit of a battle for second place with a team by the name of “The Hasselhoff Appreciation Society”. We had a pretty slick system going with one runner out, the next one would be getting ready. 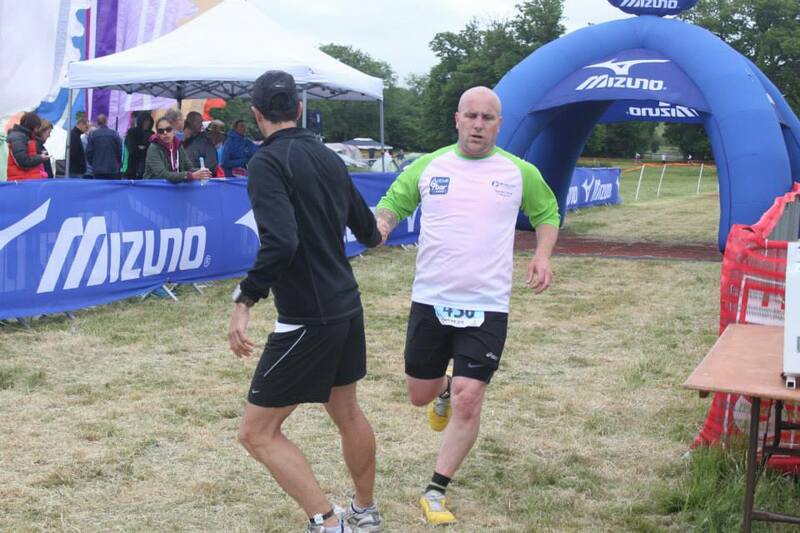 As the handover takes place then the finishing runner would then warn the next runner to get ready in plenty of time. This meant we always had a runner ready for a handover and no time was lost during the transition. 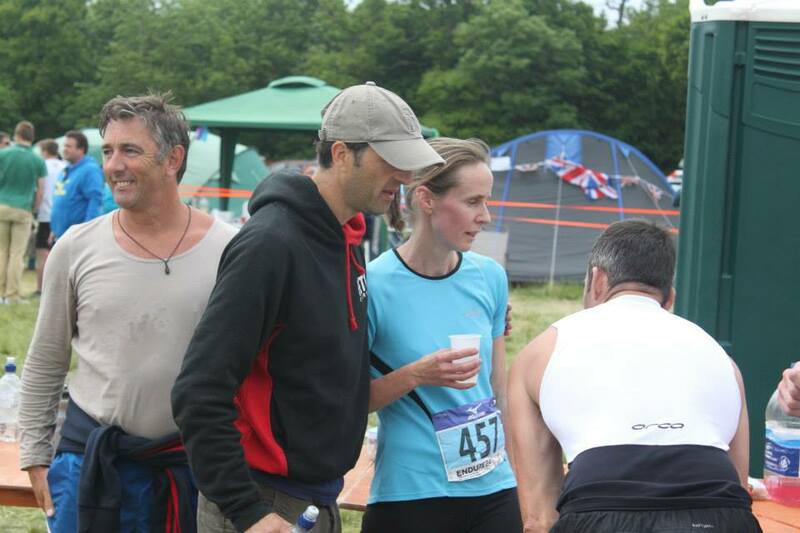 We did witness a few examples when a Team runner would arrive at the finish and find the next runner wasn’t ready which then wasted valuable time as they either waited or searched for their team-mate. In fact, I did witness one example of two runners hammering the final straight battling with each other to get ahead only for one to find there runner wasn’t ready and then losing minutes of time. Our team had instructions to run a second lap if someone wasn’t ready but credit to the team that we had no slip ups whatsoever even during all the night phases. The race plan we had gave everyone an approximate running time so people could plan a couple of hours kip although we did make sure we knew where people would ne sleeping so we could wake up the right person although I don’t think any of us slept much that night to be honest. As Matt finished his first lap he handed back over to Pat and we were going to cycle through the team in the same order. Pat put in another strong lap (30.57) before handing over to Stouty (38.08) who then handed over to me for my second lap (35.23) which did involve a very brief comfort break! It was quite a nice feeling this year to fly past the solo runners but I did try and encourage all of these people on the way, I know how it feels to be out there for the full 24 hours! I handed over to Paul H (33.04) who handed over to Jo (42.45) then Andy (38.24) who was starting to make a name for himself with his lightning charges down the final straight. 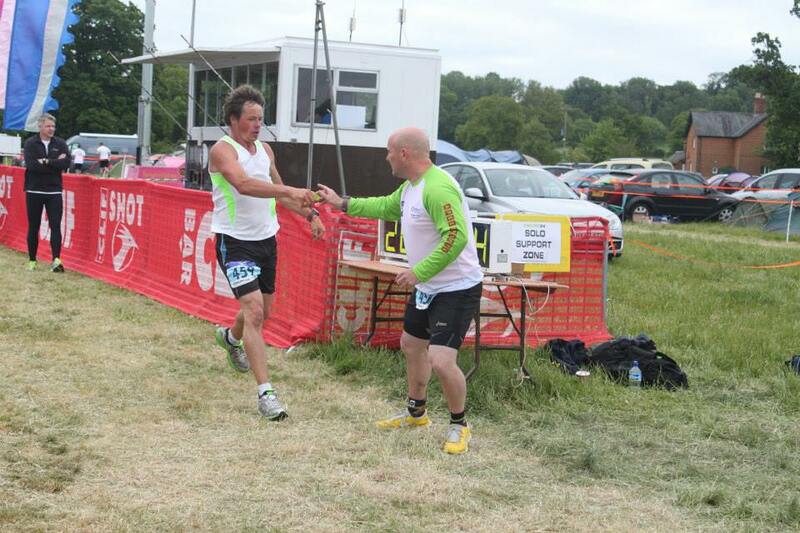 Andy passed the band onto Cath (38.06) and finally Matt again (37.18). As runners were out, the rest of us settled around the camp had some chili for tea and something to drink (alcohol for some and water or coke for others) and we also started to ready our sleeping arrangements for the night. Our camp area was being shared with 4 other local Newbury Runner teams and there was a good friendly atmosphere between the teams and shared support with food and drink. It was now getting dark and runners were required to wear head-torches from 8pm onwards. With darkness falling and legs stiffening up, times started to slip by a couple of minutes each during this phase. Pat completed his third lap (32.28) before handing over to Stouty (38.46) who then handed over to me around the 10.30pm time. I set out at a slightly steadier pace at the start and I was using my Lenser H14 torch which was super bright and it lip up the trail well meaning I could run with a bit of confidence if only my legs would respond! I found it a real struggle to get any sort of pace up despite the effort and shallow breath. My first 3 miles were all around the 8m/m mark but after warming up I finally started to crank up the pace and ran a negative split with a 7.38m.m and then a 7.11m/m finishing in 38.42. In fact I felt as if I could have carried on having finally warmed up but was also relieved to hand over to the next person and then getting an couple of hours of sleep. I wandered back to the campsite as Paul H took over from me and put some fresh running kit on ready for the next leg and then put some trousers and a jumper on, had something to eat and drink and settled into my comfortable sun lounger/mattress/sleeping bag combination. I didn’t sleep much at all before my next leg around 4am. Paul H had put in another good shift finishing in 34.42. 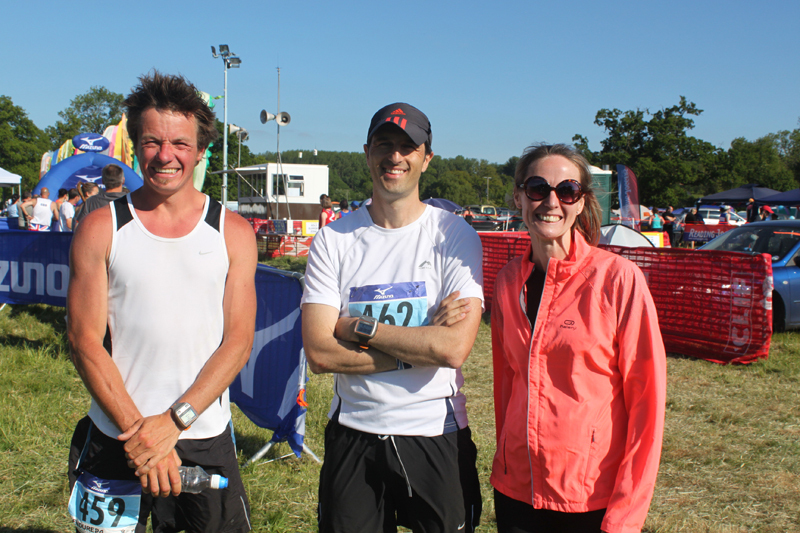 Jo followed up with a 47.02, Andy managed a 40.32 and Cath who was probably our most consistent runner with her pacing finished in 39.53 and Matt completed our 3rd lap each with a 40.52. We had a good team spirit going with people constantly going out to check the runners coming in and out and making sure people were ready on time. We had slipped slightly from our race plan as expected but were only about 20 minutes off our total time (based on assumed PB times every lap). Even better was that we were in 2nd position and had built up a small lead (15 mins) on the 3rd place team. The Reading Joggers team were well ahead by now but second place was achievable. The routine started again for the fourth time with Matt handing over to Pat (34.01) who handed over to Stouty (40.21) who handed over to me. 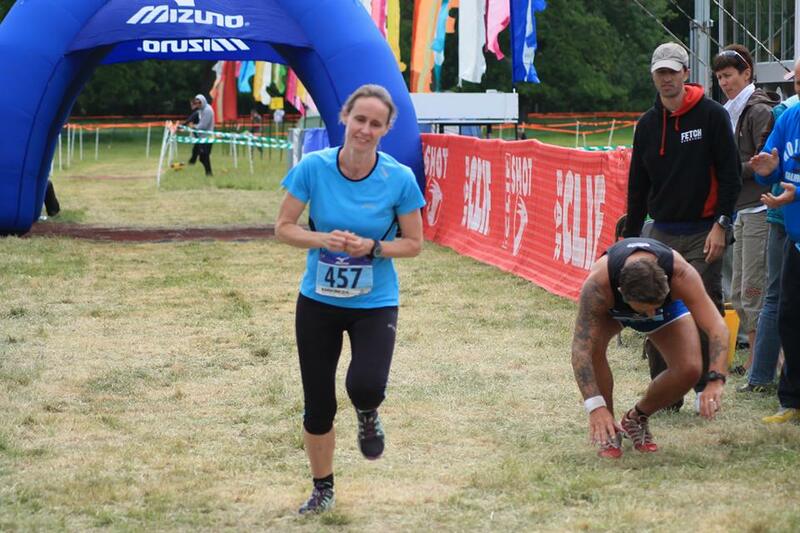 My 4th lap went the same way as the third with a slightly more sleep deprived and stiff leg effort. It was starting to get a little bit lighter with the first traces of dawn as I started my lap but I still needed to use the head torch for most of the route especially through the wooded areas. The lap went the same way as before with my legs really struggling to get going for the first few miles but I ran a negative split again and improved the pace each mile from an 8.23 to a 8.19, 8.09, 7.38 and finally a 7.21 for the last mile (39.14 in total). I handed over to Paul H who set off and wandered back to camp, got changed into some warm clothes and crashed out into my slightly untidier than I had left it sleeping bag. I managed to doze for an hour or two and woke 6am ish. The tent door had been left open for people to wander in an out of (it was a large tent) and I was feeling the cold. 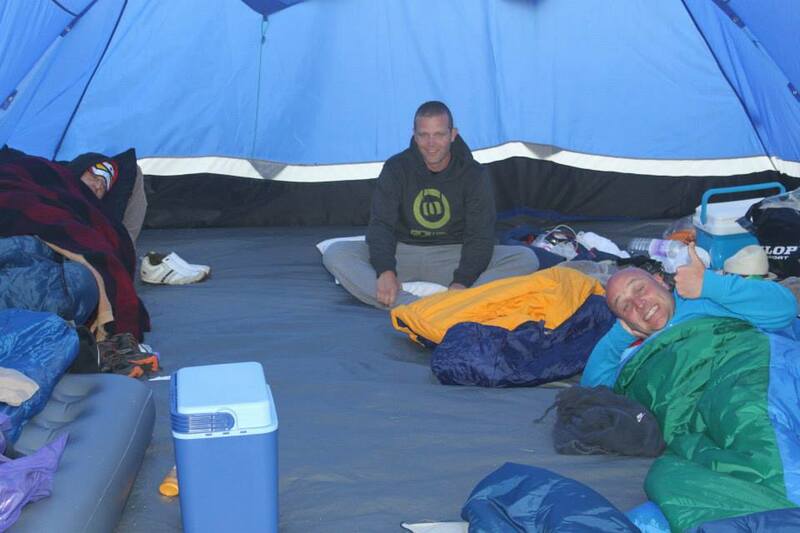 During my sleep Paul H (35.43), Jo (46.05), Andy (39.59) had completed their laps and Cath was soon to. I had another couple of hours before I was due to run my final lap and tried to sleep a bit more but failed. I than decided to look at the race place and see how we were doing. Cath came in after another consistent lap (38.59) and Matt went out for the fourth time and finished in 40.17. Looking at the plan, I calculated that we were not going to cover 5 laps each with the slippage due to the night (and tired legs) but at least 6 of us would cover a 5th lap. I didn’t think we would get a 7th person out due to the drift in lap times at that time but we would get a better idea after a couple of people had completed their 5th laps. After looking at the race plan, Jo volunteered to be the person not to run after putting in 4 laps she had done a great job. 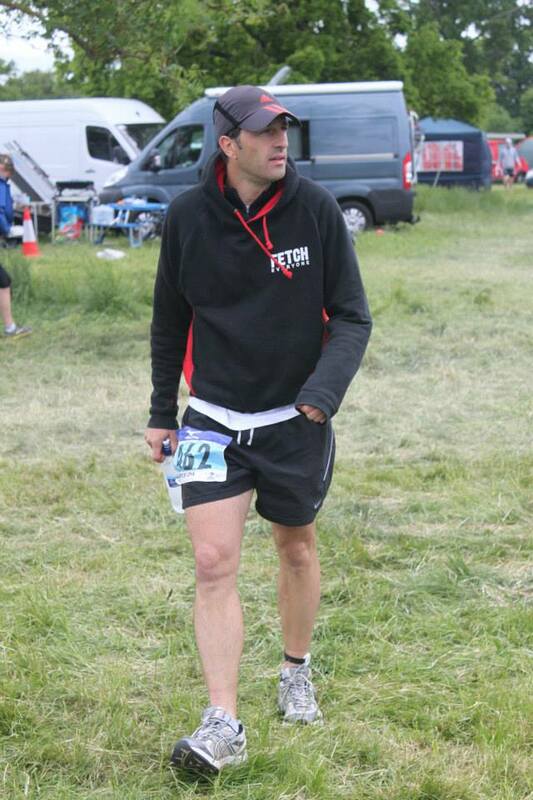 To be honest I would have been quite happy not to run again as my groin was sore, legs were stiff, I was tired. However when I thought about it further, it felt like a feeble excuse and everyone was probably feeling the same and I did want to finish another lap. Pat set out for his 5th lap and belted out another superb time of 32.14 followed by Stouty (38.35) who then handed over to me about 8am in the morning. My groin was pretty sore to be honest and I struggled to get going but it was now light meaning you could see a bit more clearly and I followed the pattern of speeding up mile on mile from a 7.53m/m to 7.38m/m, 7.49m/m (another impromptu comfort break) a 7.21m/m before arriving at my final mile of my final leg. I spotted a fellow Reading Jogger runner Dave catching me up and gave him some encouragement to pick it up and catch me up before he returned the favour and tried to drag me in a bit quicker. The final lap was a 6.56m/m which was quite nice to finish on a sub 7 at last and I handed over to Paul H pretty exhausted and immediately went back to camp to get changed and have something to eat and drink. Stouty was at the campsite and kindly showed me his new temporary tattoo in my honour (don’t ask!) 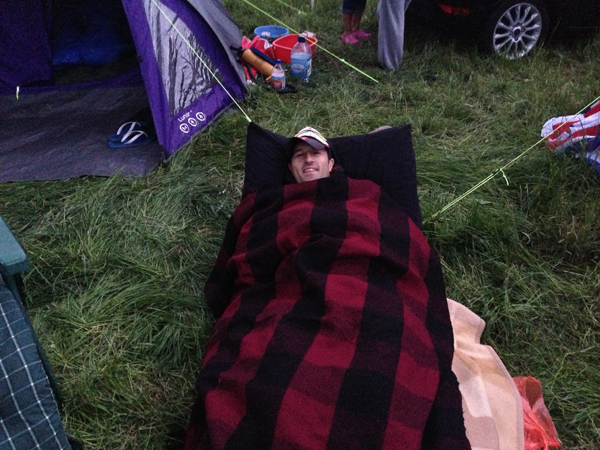 and had even kept my bed warm when I was away running a lap (seriously, don’t ask!). I got changed, snacked on some food and then went to watch the other runners and look at our timing and position. We had built up a 20 minute lead on 3rd place but it was going to be pretty close as to whether we could get a runner home before the 12 noon cut off and start another lap. I felt confident we wouldn’t lose a 20 minute lead but the mission became about getting our final runner Matt out before 12 noon. Andy came steaming around the final corner and started hammering the straight as we started to scream encouragement at him, our own personal race was getting very exciting as the team cheered him on. Andy belted out the final few metres handed over the wrist band and collapsed on the floor. He had run a 39.51 giving us about 40 mins and a few seconds to get Cath in. Cath set out on her final leg and hooked up with another runner. 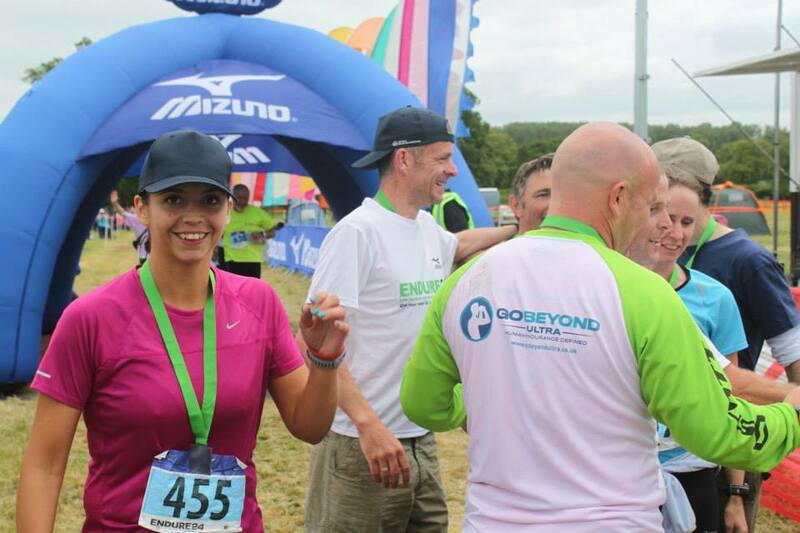 We waited nervously around the start and finish area for the next half an hour before she appeared for the final mile with the other members of the team. I looked at the clock but it was obscured from view but spotted Matt, kitted up and ready for a extra leg… would we get to him before 12 noon. The team ran between parts of the final mile giving Cath every bit of encouragement we could as she weaved around the final few turns. I spotted the clock, there was only 5 minutes to go but we must be within the last half a mile, this was going to be close. Cath continued her good pacing as she entered the final couple of straights, we had 3 minutes on the clock I thought we were going to be ok but the timer was still ticking over. 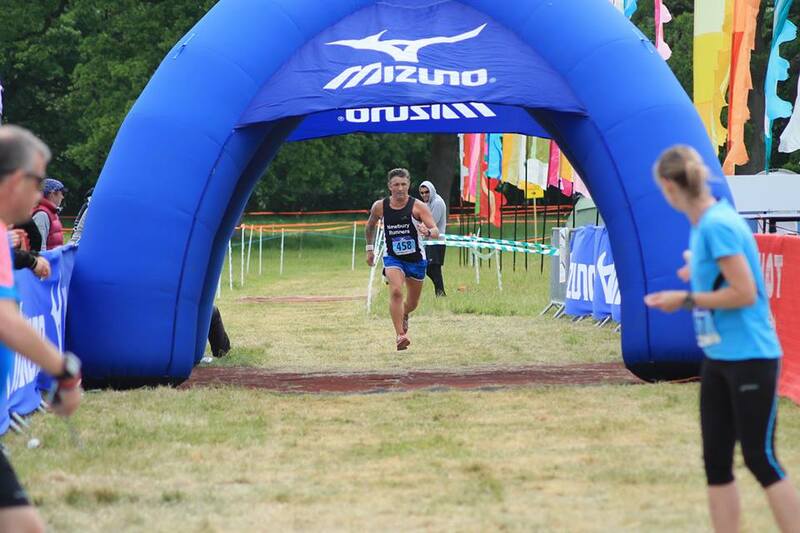 Cath made her final dash down the last straight and finished in 38.32 about 23hrs and 58 minutes into the race. Talk about cutting it fine! Matt set out on the glory lap with us secure in the knowledge that we were in second place as the 3rd place team would not be able to get another runner out. As we waited for Matt, the whole team congregated near the finish. We had all planned to run the final leg together and finish as a team which has started to become a bit of a tradition at this event. About half an hour later Matt appeared and he completed the final mile before we all joined him for the final dash to the line for a fantastic team finish! Matt had finished his lap in 38.24. Overall, we had covered 39 laps and 195 miles which was a fantastic effort and really close to the dream plan of 200 miles with a PB time every lap. Amazing effort everyone, well done! 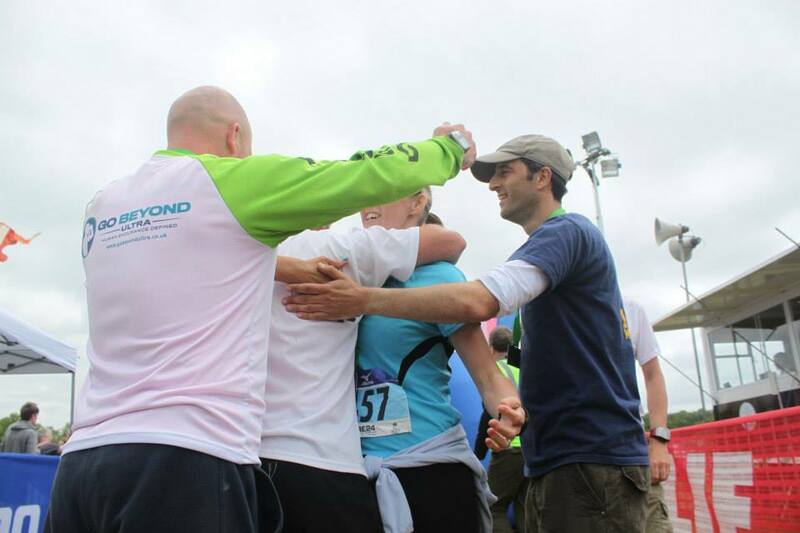 We congratulated each other on our efforts and then had a few team photos taken before we then waited around and supported other runners coming into finish their races. It was a very tiring but really enjoyable weekend. From a racing point of view we did better than we could have hoped for, the race plan was well executed, the team work great, handover’s slick and levels of effort were fantastic. Despite Pat and I not really knowing the other members of the team before, we all bonded pretty well and had a great team spirit which was evidenced by the support at the end. 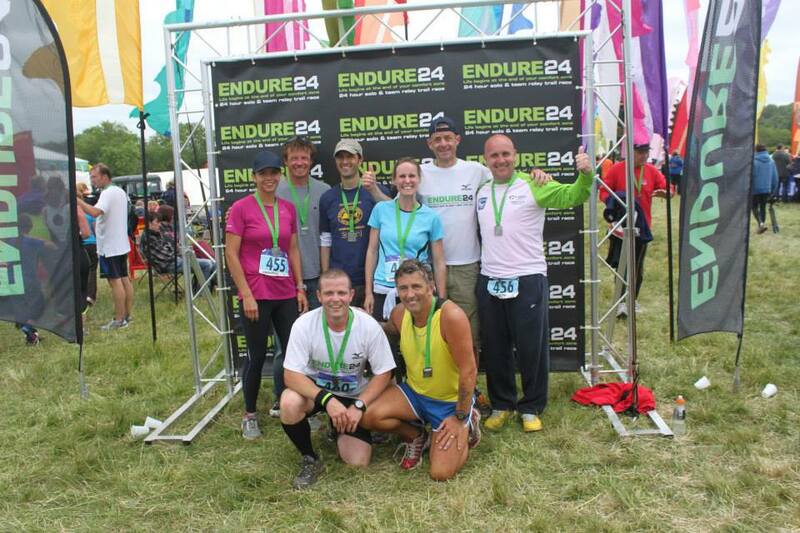 The Endure 24 is a fantastic and well supported event with over 700 runners taking part and enjoying the fine weather over the weekend. I will definitely be back in future years whether this is as a Solo or Team Runner or maybe I should get an Ultra Tales team together.. anyone up for it?